48 hour notice of cancellation required. Cancellations made within 48 hours of arrival are subject to a cancelation penalty equal to first night room rate and taxes. A deposit equal to the first night rate plus taxes is required when booking the reservation. Please note that a reservation which requires a deposit, down payment, or (wholly or partly) prepayment may be cancelled (without a prior notice of default or warning) insofar the relevant (remaining) amount(s) cannot be collected in full on the relevant payment date. We are a dog friendly B&B. Due to allergies we cannot accommodate cats. A daily dog rate of $25 per day applies. We can accommodate up to (1) dog per reservation. Violations of our pet policy including any room that has a non-disclosed pet will be charged $100 per night fee. Animals are not permitted to be left unattended. Unattended animals will be cause for removal from property and subject to a $150 fee. Any damages stemming from an animal to furniture or fixtures will be subject to a fee for replacement not to exceed $250. A deposit equal to the first night rate plus taxes is required when booking the reservation. Please note that a reservation which requires down payment or (wholly or partly) prepayment may be cancelled (without a prior notice of default or warning) insofar the relevant (remaining) amount(s) cannot be collected in full on the relevant payment date in accordance with the relevant payment policy of the Supplier and the reservation. 48 hour notice of cancellation required. Cancellations made within 48 hours of arrival are subject to a cancelation penalty equal to first night room rate and taxes. We are a non-smoking property. Smoking is not permitted in our house or grounds. If you do smoke there is one area of the property reserved for guests who do smoke. Please stay in that area only. Thank you for consideration of all our guests. Smoking in our rooms will incur a minimum $250 penalty. A valid photo ID matching the reservation may be required when checking into the property. Any dispute or claim arising out of or in connection withany provision of this Agreement will be finally settled by binding lowest cost"desk" (submission on the papers only) arbitration in California, inaccordance with the rules of the American Arbitration Association by onearbitrator appointed in accordance with said lowest cost "desk"arbitration rules with each party bearing the cost (up to $750 each) for saidlowest-cost AAA arbitration and the written ruling of the Arbitrator shall befinal and binding on the Parties and may be entered in any court of competentjurisdiction. The Arbitrator shall, inaddition to all other remedies allowed under this Agreement, provide reimbursementof all attorney's fees, arbitration fees, costs, and expenses to the prevailingparty in the arbitration." 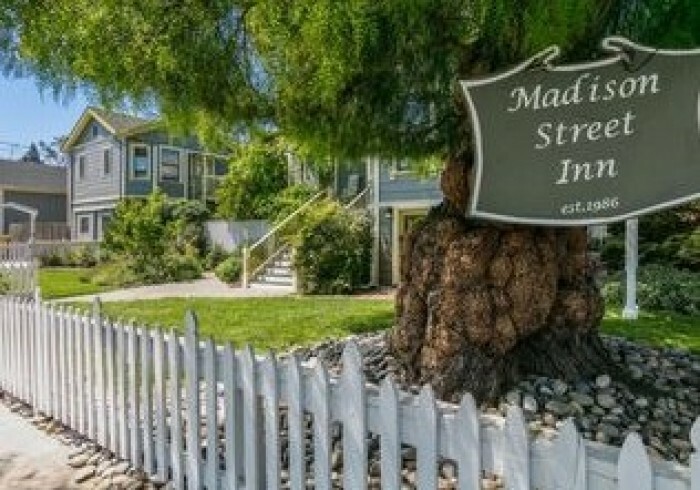 A beautiful bed and breakfast set in the heart of Silicon Valley is an ideal place to stay if "life" brings you to our town. Located in Santa Clara, California, our B&B Inn offers lodging 10 minutes from San Jose Airport and 15 minutes from both Santa Clara and San Jose Convention Centers.